The Islamic Republic of Iran’s near total monopoly on the broadcast of film and television series has effectively ended following the January 7, 2015, decision by Netflix to make its vast archive available to Iran and 129 other countries. 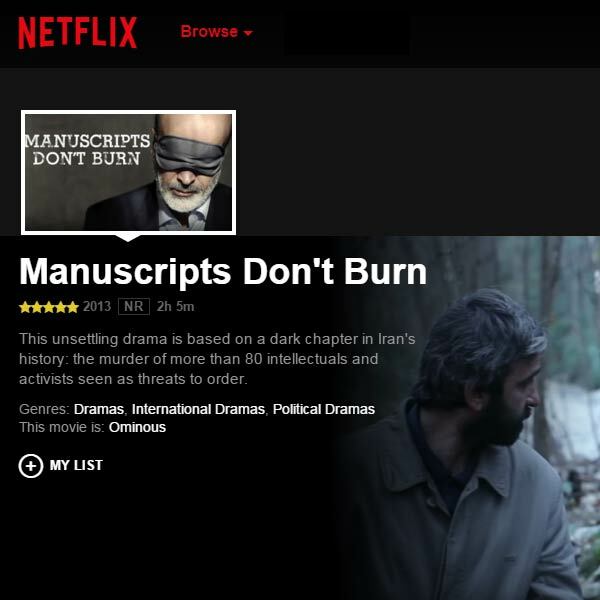 Although the International Campaign for Human Rights in Iran learned that the Netflix website was immediately filtered by Iranian authorities, users in Iran will be able to watch its full, uncensored content with relative ease with the use of proxies (tools designed to bypass Internet filtering) because Netflix does not require fast Internet speeds. The subscription-based entertainment giant’s entry to Iran has been widely welcomed by Iranians on social media. People have noted that they can now watch anything they desire, instead of censored versions aired on Iranian state television or poor DVD copies bought on the street. Until it opened up to the rest of the world, Netflix boasted having 70 million subscribers, most of them in the United States. Now most of the world can join the service, with the exception of China, North Korea, Syria, and Cuba. Service to Iran was included after world powers agreed to lift economic sanctions as part of the nuclear accord signed in July 2015. Mohammad Javad Shakouri, who runs two Iranian online movie channels, Filmeo and Aparat, wrote on his personal blog on January 7, 2016, that he pleaded with the authorities not to create obstacles to his service because they would soon have to contend with Netflix instead of national carriers. “Four months ago the Ministry of Culture and Islamic Guidance and the state broadcasting organization [Islamic Republic of Iran Broadcasting, or IRIB] started to make new troubles for us. I approached them with sincerity and told them that Netflix, which is a multi-national corporation, was in the process of purchasing films dubbed into Persian and will start providing a service to Iranians soon. Their response was that they would filter it. But I laughed and told them that filters are no longer a cement wall,” Shakouri wrote. It is not clear which authority in Iran ordered Netflix to be filtered when the entertainment company announced the start of its online service to Iran. The country’s laws require action by a judge, a prosecutor, or the Working Group to Determine Instances of Criminal Content on the Internet (Iran’s principal online filtering body), in order to block access to cyber content.